The title of this exhibition grows out of a simple children’s game of choice and relationships. The game goes something like this…Rock crushes Scissors, Scissors cuts Paper, Paper covers Rock. This exhibition similarly has three interrelated parts addressing issues of power, sexuality, and disability. Each of these familiar symbols holds a particular position in our individual experience and collective psyche; together the works present challenging positions in art and beauty through the artist’s thoughtful use of materials, scale, and humor. 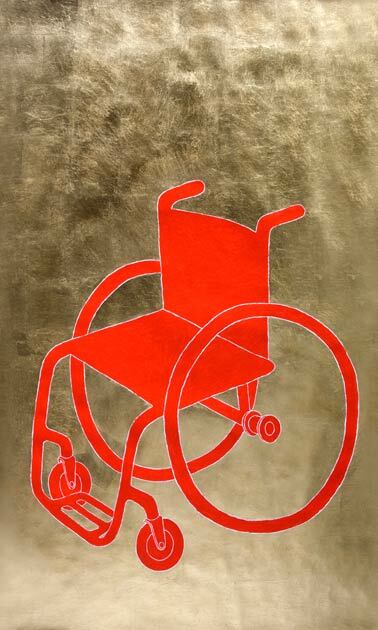 Gold Wheelchair 2015 acrylic and gold leaf on paper 70"x42"